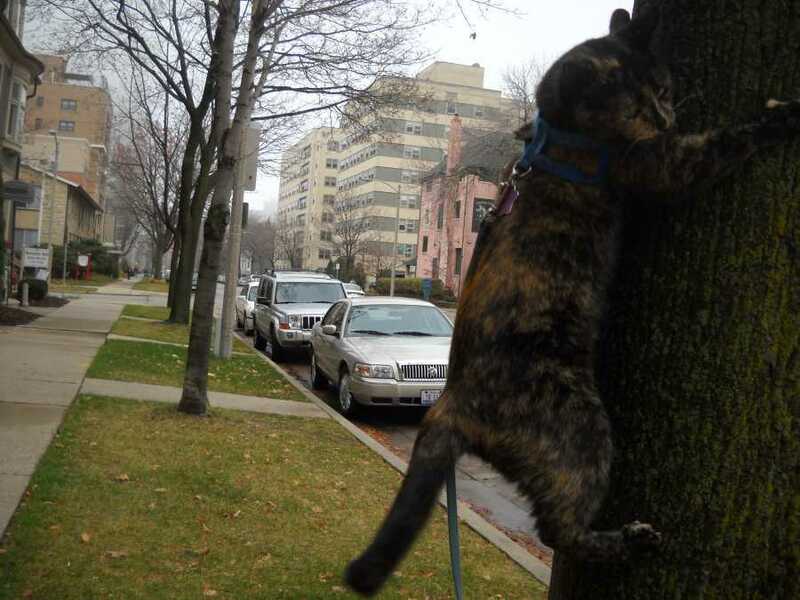 This tortoiseshell cat climbs every neighborhood we visit! Me: I'm Elizabeth the volunteer shamanic minister of Companions Circle Church who blogs here on the church's official website. For a few years, some years ago, a small circle of companions blogged here too. Some have retired from the Internet, and others shape-shifted in diverse ways, leaving me to blog on. Nowadays our circle, grown widespread (while remaining tiny) meets through inner-spaces and e-spaces. For my ministry: I shamanize moment by moment, behind the scenes, doing my best to shamanic-jest and and shape shift worldly troubles towards better and best. My freelancing colleague and traveling companion is a blogging, tweeting Tortoise Cat, who strolls the neighborhoods we visit and inhabit. Frequently we fall behind updating blogs and social networking while playing outside during the long, yearly "Cat-Grass Season" she favors, savoring life's and death's fleeting or lingering whiffs, adventuring nature's sounds and sights kaleidoscope that entertains our meandering. Most importantly, this tortoiseshell cat teaches me purring, blurring and (especially during winter) cat-nap-dreaming. Companions Circle Church, Inc. is a church of shamanic ways, centered in Milwaukee, Wisconsin, the Internet, and anywhere within the realms of ordinary and non-ordinary reality where two or three or more companions adventuring shamanic ways open a circle to shift reality beneficially. Shamanic Shift Center is the church's mother-ship project, for shamanizing over ordinary challenges and troubles amid everyday situations and events, at any crossroads of here and now. Members of Companions Circle declare themselves so and participate privately or publicly as they travel their earthly journeys and remain members by supporting the mission and by living shamanic shifting, each in their own ways, day by day. The church recognizes all shamanizers who participate and support the church's non-profit (charitable and educational) mission. According to this church's teachings, the universe is the church and its sanctuary is any circle of two or three or more, opening anywhere around intentional beneficial shamanic shifting, expressed through voluntary, cooperating, helping actions--or right rites--re-creating everyday life on purpose through natural, artistic and psychological shamanic ways. Our circle practices original and innovative shamanic ways--new now, not traditional.